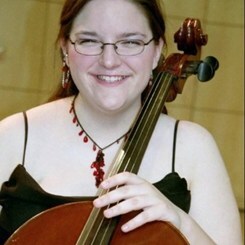 Plays cello, violin, and viola, and has a degree from Truman State University in progress. Graduate of the McCallum Fine Arts Academy in Austin, TX. Studied with Erna Buckles, Betsy Sanders, Mira Frisch, and Brian Kubin. Currently performs with the String Theory Quartet in Pittsboro and Nyquist Music in Chapel Hill. Teaching experience includes private, group, and large ensemble instruction, all ages.